Argentina’s Angel di Maria lies on the ground after getting injured during the World Cup quarterfinal between Argentina and Belgium in Brasilia, Brazil, on Saturday. The injury to Brazil’s Neymar might have made more headlines, but Argentina will also be shorthanded in its World Cup semifinal. Attacking midfielder Angel di Maria, who was hurt in the first half of Argentina’s win against Belgium, will miss the team’s match against the Netherlands on Wednesday. Di Maria is a big deal. He ranked No. 72 on The Guardian’s list of the world’s top 100 footballers and was UEFA’s man of the match in Real Madrid’s victory over Atletico Madrid in this past spring’s Champions League final. 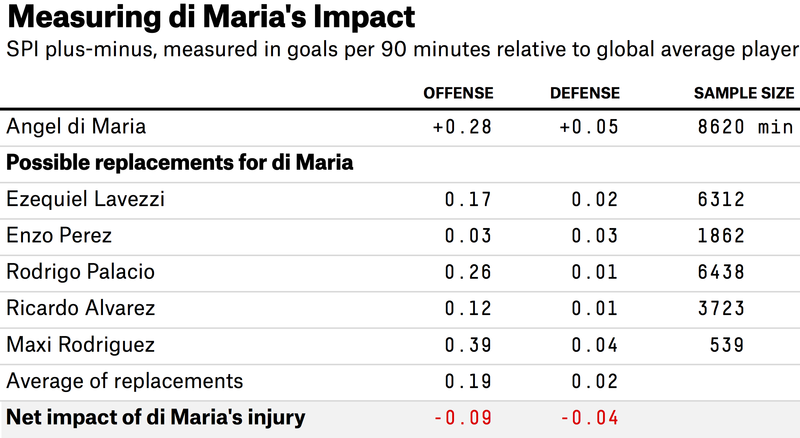 We can evaluate the impact of di Maria’s injury the same way we did for Neymar — by using the plus-minus rating system embedded within ESPN’s Soccer Power Index (SPI). The plus-minus system has some blind spots. It will underrate world-class defensive players whose contributions don’t show up in the stat line, and it has a limited sample of data for players who don’t play in one of the top five club leagues in Europe. But for di Maria — an attacking player in Spain’s La Liga — it should do reasonably well. The system estimates that di Maria is worth about 0.33 goals per 90 minutes of play, relative to an average international footballer. (Of these, 0.28 are from his offense and 0.05 are from his defense.) That’s not quite in Neymar’s league, but it would imply that di Maria is somewhere around the 30th best player in the world — a little ahead of where The Guardian ranks him. Some of di Maria’s value lies in that he can play center midfield or on the wing. That flexibility also makes it hard to say how Argentina will replace him. There are at least five possibilities, including forwards Ezequiel Lavezzi and Rodrigo Palacio, and midfielders Enzo Perez, Ricardo Alvarez and Maxi Rodriguez. In contrast to Neymar’s potential replacements — which SPI had rated about evenly with one another — the footballers who might spell di Maria are seen rather differently by the system, as shown in the chart below (numbers are rounded). SPI rates Palacio and Rodriguez highly, Perez relatively poorly, and the others somewhere in between. But the ratings for Rodriguez and Perez are based on a small sample of games. (This is especially so for Rodriguez, who plays for Newell’s Old Boys in the Argentine Primera Division, not a league that we track.) Therefore, I’ve weighed the potential replacements by the number of minutes with them on the pitch in recent games in the SPI database. This weighted average estimates that the replacements are the equivalent of 0.13 goals per 90 minutes worse than di Maria, including both offensive and defensive play. This is enough to lower Argentina’s chances of beating the Netherlands from 57 percent at full strength to 53 percent. Nevertheless, the trade for Argentina — one missed match for di Maria (it’s hoped he’ll be back for the final) in exchange for two Neymar absences and one Thiago Silva suspension on rival Brazil — isn’t a horrible one. The injury-adjusted version of our World Cup odds, shown in the table below, gives Argentina a 21 percent chance of winning it all. This is slightly higher than the unadjusted version, which assumes Argentina and Brazil are healthy and puts Argentina’s chances at 20 percent instead.